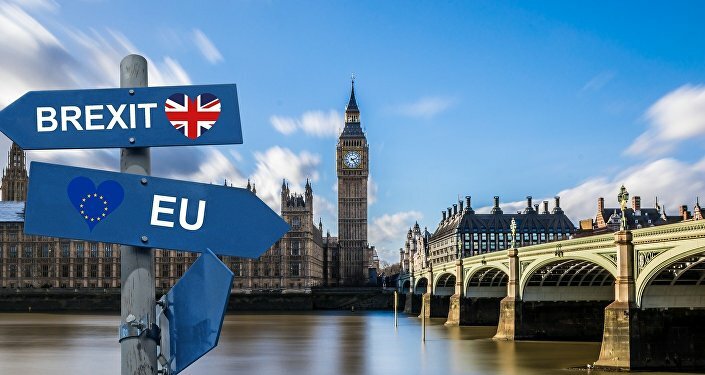 The UK seems to be on course to participate in the upcoming European parliamentary elections; an eventuality that would leave egg all over the faces of both Westminster and Brussels. Sputnik spoke with millionaire businessman Sir Benjamin Slade about how the Brexit debacle will affect the UK political scene. Sputnik: Will the UK end up participating in the European parliamentary elections? Sir Benjamin Slade: I think the whole thing is madness, and we shouldn’t be taking part. What do the Conservatives stand for at the moment? They are all split and what does Labour stand for? They are all split, they can’t agree on anything. The public could say this is another referendum, but what are they going to do? Are they going to vote for the Change party, the Brexit party or UKIP? The thing is madness. I absolutely despair. Mrs May is trying to stay in her job as long as possible, apparently, her fingers are glued to the desk in Downing Street, it's pretty serious. Some people don’t realise when they’ve got to go. It would be nice to keep the £39 billion, it would be nice to do WTO rules because if we do that; we have our foot on their throat, because £97 billion comes in this way, which we are going to tax, and £43 billion goes out, they are going to do a deal on that. WTO doesn’t apply to all the car industry and various other industries; for instance, one fifth of the car industry from Germany is going to go straight down the tubes, because we can tax that at a higher rate, so they are going to do a really good deal for us. At the moment they’ve got their foot on our throat because we don’t have good negotiators, it is much better if we have the gun on the table. I remember various countries in West Africa; you negotiated, you always kept your loaded gun on the table, now we have a gun; and if you take it off, we have this gun which says you’re out, and that is like pointing both barrels at them. To take it away and hide it and say we’re not going to do that, is absolute madness. Sputnik: How will British politics change after the Brexit debacle? Sir Benjamin Slade: I think what’s happened in America where the people vote; you know, down in the rust belt all over America, those people have said what they want, and they wanted to get rid of the Washington elite, and I think it’s got to happen here. We’ve got the Westminster elite; these people are telling us what’s good for us. Before this thing they spent nine billion with Cameron saying it’s going to be a disaster, and after all this was thrown at them, and it was all lies, fifty-two percent said we’re out, because they think it’s better to run their own country and be democratic, and I think that’s going to happen in France as well. The views and opinions expressed in this article are solely those of the speaker and do not necessarily reflect Sputnik's position.